Monday, March 9, 2009 at 1:19 p.m. Governor Jon Corzine will unveil the fourth budget of his administration tomorrow. The fiscal reality is that he will have to make serious cuts in the state budget. The political reality is that he will have to do so in such a way that he doesn’t anger core constituencies (such as state workers and teachers unions) and also appears to spread the pain fairly (so he doesn’t tick off independent voters who are critical to his reelection prospects). Not an easy task. Especially since he is not starting this process with a wealth of public goodwill. It’s worth taking a historical look at the governor’s job approval ratings during his prior budgets (see charts below). Just three months after taking office in 2006, both the Quinnipiac and Monmouth U/Gannett NJ polls showed Jon Corzine’s job performance in the net negative region (i.e. more voter disapproved than approved of the job he was doing). Corzine decided to take a hard line with his first budget in 2006, shutting down state government until the legislature agreed to pass what he felt was a fiscally responsible budget. In the end, the final budget included more than $300 million in so-called “Christmas Tree” items, specific spending earmarks inserted by various legislators. The governor argued that this was his first budget and the process for legislative negotiations preceded him, but he vowed that the earmarking would be eliminated in future budgets. (President Obama is making much the same argument as an earmark-laden omnibus spending bill heads to his desk this week). Indeed, Governor Corzine’s approval rating climbed back into positive territory after the budget agreement was reached in July 2006, even though the budget also included a one cent increase in the state’s sales tax. The governor assured the state that the following year’s focus would be on relieving the state’s highest in the nation property tax burden. In November 2006, as a special legislative session on property taxes met, voters approved a half penny dedication of state sales tax revenues toward property tax relief. The governor’s job ratings remained basically stable. The governor’s rating became muddied in the spring and summer of 2007, as it was entwined with his serious automobile accident and subsequent recovery. He did sign a budget without Christmas tree items that year, although overall spending continued to increase. His ratings remained relatively positive and stable throughout this period. However, by the fall of that year, the governor’s job rating started to decline. In November 2007, voters rejected a bonding measure to fund stem cell research. While this garnered most of the media attention, the more significant vote was the defeat of a measure to dedicate another half penny of the sales tax toward property tax relief. This was basically identical to the measure voters had supported just a year before! The problem was that the prior year’s special session never resulted in the property tax reform that homeowners were seeking. Instead, Trenton brought back property tax rebate checks. My interpretation of the 2007 vote on the half penny dedication is that voters didn’t want to be a party to what they saw as a shell game with tax revenues. (Ironically, the rebate program is one of the budget lines likely to get the ax tomorrow). These events took a toll on the governor and his approval ratings started to decline in the fall of 2007. However, the real hit was yet to come. In January 2008, Governor Corzine announced a plan to raise tolls in order to fund transportation projects and pay off state debt. His approval ratings took a nose dive, and they continued to drop as he held town hall style meetings around the state to sell his plan. His net job approval numbers went into negative territory for all three polls that regularly track New Jersey and stayed there throughout most of the year. By June 2008, Governor Corzine had dropped the toll plan and signed a budget that kept total state spending flat. His numbers improved slightly, but remained negative overall. His ratings further improved during the fall, but this may to have been largely an effect of the presidential campaign. After Obama’s inauguration in January, Governor Corzine’s job ratings began to drop. Thus, he embarks on his fourth budget process with public approval in negative territory. As I said at the outset, not an easy task. A note on the above charts. 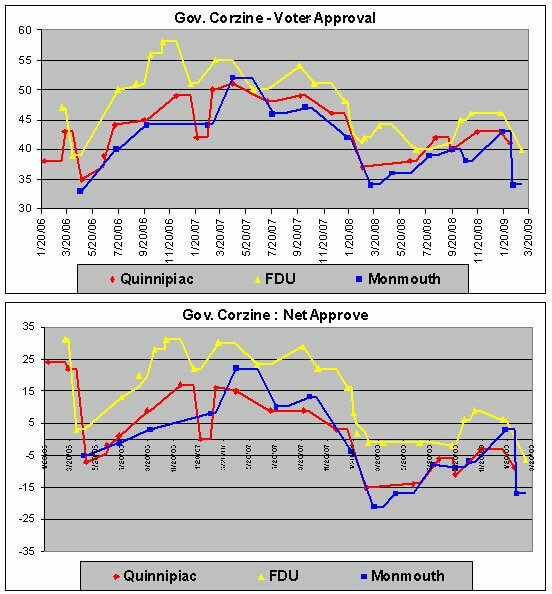 Each chart presents the results for three polls that regularly track Governor Corzine’s job ratings: Quinnipiac University, FDU-Public Mind, and Monmouth University. The first chart presents the percentage of registered voters who approve of the job Corzine is doing. The second chart presents the net job ratings (i.e. % approve minus % disapprove). The Quinnipiac and Monmouth numbers tend to track fairly close to one another, with a few exceptions. The FDU numbers tend to be higher than the other two polls. However, all three polls’ trend lines tend to move in the same direction. Since Monmouth University showed only 37% of Democrats believe Corzine deserves re-election, two other universities released polling data distorted by faulty questionaire development. This simple lack of adherence to design rules has left New Jersey with the false belief that Corzine remains ‘electable’ in a Democratic primary. Consequently, no serious challenger has emerged to take on Corzine in the primary, which would have been an act requiring the kind of courage that is in such short supply in New Jersey government today. Dr. Murray’s previous post, Question Wording Matters, hit the nail on the head but in reference to another issue. The order of questions and their relation to each other has a contextual effect on respondants. If I asked you to choose between George W. Bush Jr and Bill Clinton, who would you pick? What if you were selecting a former president to chaperone your teenage daughter on a weeklong scholarship trip to Montreal, Canada? If you selected Bush in the first instance or Clinton the second then you probably miss my point, but since context matters some might see why I am disturbed by those pollsters who seem to have concealed the fact that Jon Corzine is not ‘electable’ in a contested primary even though he could prove ‘unbeatable’ in November.